Paeonia Miss America, what a beauty! The buds of this peony variety start out blush-coloured, but turn completely white when they bloom into thick flowers. 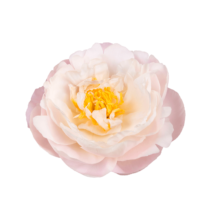 This lovely combination of colours and its open centre make the dreamy Miss America an ideal peony for summer bouquets. In 2017 we planted her in Spain and France to because we love her so much. We can't wait for her to come in production in this sunny habitat. This semi-double flowered peony has strong, sturdy stems and thick, green leaves. The buds are large and bloom explosively in mid-season. Its blush colour will slowly fade to white when blooming. Paeonia Miss America was registered in 1936 by Mann and van Steen. It’s a parent of a new and phenomal peony, Norma Volz.